These high-altitude orchids from the New World Tropics flourish where cool temperatures prevail year round. 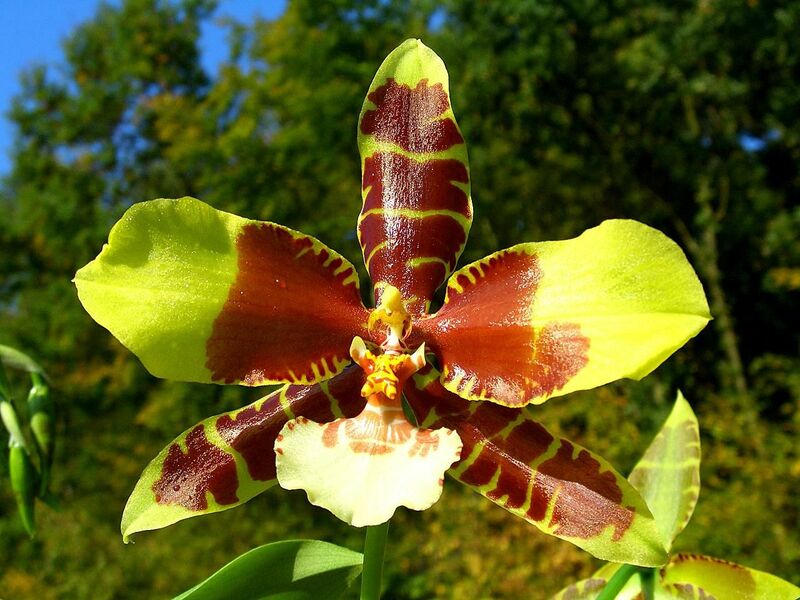 Odontoglossums are known for their striking sprays of flowers. Culture is similar for hybrids in this group, some being Odontonia, Odontioda and Vuylstekeara. Light should be bright. In a greenhouse, levels from 2,000 to 5,000 foot-candles are acceptable as long as heat levels can be kept down. If summer day temperatures are high, light levels can be reduced to cool the growing area. While these are not generally considered to be good houseplants, they may succeed at an east window or a shaded south window; western exposures are usually too warm in most climates. Temperatures must be exacting for these plants. Day temperatures below 75 to 80 F are almost essential year round. Night temperatures of 55 to 58 F are best. Short periods of warmer day temperatures may be tolerated, especially if humidity and air movement are at optimal levels, nights are cool and the plants have healthy root systems. Water should be plentiful, coupled with perfect drainage. The potting medium should just begin to dry before watering. This may mean watering every two to seven days, depending on weather, pot size and material, and type of potting medium. Accordion-pleating on leaves is a symptom of insufficient water or humidity. As with other orchids from high-rainfall areas, odontoglossums are particularly sensitive to poor-quality water, which will give poor roots and leaf-tip burn. Humidity, coupled with moving air, should be ideally 40 to 80 percent. Evaporative cooling in a greenhouse increases humidity while cooling the air and is highly recommended for these orchids in most climates. Fogging the air or dampening the floor with water also helps cool and humidify. In the home, set the plants on trays above moist pebbles, with the pots resting above the water. Fertilize regularly with a dilute solution while plants are actively growing. Applications of 30-10-10 formulations twice a month are ideal for plants in a bark-based potting medium. A 20-20-20 formulation should be used on other media. If weather is overcast, applications once a month are sufficient. Some growers use a high-phosphorus 10-30-20 blossom-booster formulation as plants approach flowering to increase flower count and substance. Potting should be done as new growth becomes about half mature, which is usually in the spring or autumn. These plants need to be underpotted, so when repotting leave only enough room for one to two years of new growth. Underpotting also enables the grower to provide the more frequent watering these plants need as the smaller pots dry more quickly and evenly when filled with roots. A fine-grade potting medium with excellent drainage is required; because the medium is kept moist, annual or biannual repotting is normal. Spread the roots over a cone of potting medium and fill in around the roots with more medium. Firm the potting mix around the roots. Keep humidity high and the pot dry until new roots form.